Brampton politics was swept into a furor at the end of 2018 when a scandal broke around MP Raj Grewal. The story was devoured as the details gradually came out: Gambling. Huge debts. Mysterious income. Ethics and RCMP investigations. Questionable land deals. The story had it all. A week after the scandal was launched into the public eye with a resignation via Facebook, the 33-year-old Grewal, first elected in 2015, was booted from the Liberal caucus. He remained silent for eight long days. Then he emerged with a video statement explaining that he had paid back his gambling debts and was reconsidering his resignation, which he said he’d announced in a “highly emotional state.” Grewal said he would let the citizens of Brampton know in the new year what he had decided. 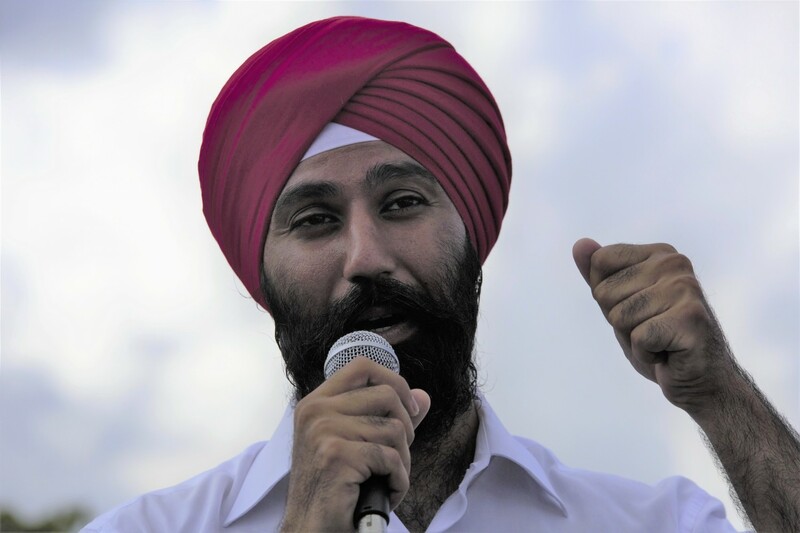 The Pointer attempted to reach Grewal at his parliamentary office, his constituency office and via email, to no avail. A spokesperson at his Brampton office explained that the request for a statement on his political future would be passed on to Grewal, but no response ever came. While the public airing of Grewal’s gambling debts and the controversy involving his connections to a local developer who’d been invited to attend Prime Minister Justin Trudeau’s much-maligned trip to India in early 2018 thrust the MP into national headlines, trouble had been simmering in the background for some time. Here’s the story up to this point. The gambling problem wasn’t Grewal’s first brush with controversy last year. The year did not start off on the right foot for the Brampton MP, who invited the CEO of Brampton-based construction firm Zgemi Inc., Yusuf Yenilmez, along on a February trip to India with Prime Minister Justin Trudeau and a delegation of MPs — a trip much criticized by the Opposition for appearing to be little more than photo-ops with Trudeau in traditional Indian garb, while raising serious security issues. It was later revealed that the RCMP knew that Jaspal Atwal, a man convicted of the attempted assassination of an Indian cabinet minister, attended several events with the PM but never informed Trudeau of that fact. Yenilmez attended functions during the official visit, which featured meetings and events with influential politicians, business people and bureaucrats from Canada and India. It was later learned that Grewal was on Zgemi’s payroll, receiving what was labelled as “employment income” in Grewal’s public disclosures to the Office of the Conflict of Interest and Ethics Commissioner. The disclosures also revealed that Grewal was receiving payments from Brampton-based law firm Gahir and Associates. 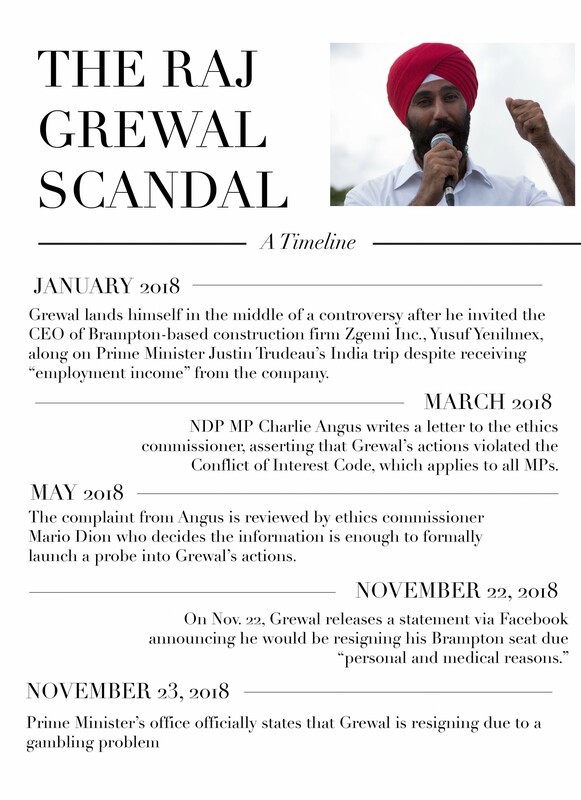 In response to the controversy about Grewal’s connections to the construction firm and its CEO, NDP MP Charlie Angus wrote a letter to the ethics commissioner asserting that Grewal’s actions violated the Conflict of Interest Code, which applies to all MPs. The complaint from Angus was reviewed by ethics commissioner Mario Dion, who decided the information was enough to formally launch a probe into Grewal’s actions. By the fall, it appeared Grewal had weathered the storm. After appearing alongside his fellow Liberal MPs and Trudeau at a Brampton summer picnic, he was back to speaking on key items in the party agenda. The Pointer reached Grewal following the Liberal announcement of increased immigration targets, which will allow up to 330,800 people to obtain permanent residency this year, rising to 341,000 in 2020 and 350,000 in 2021. Grewal spoke highly of the plan and said he was encouraged by the new targets, which will allow more skilled workers to enter the country and boost Canada’s labour market in an increasingly competitive environment. He showed no sign that, only 19 days after that conversation, he would be stepping away from Parliament Hill. His words suggested a commitment to improving relationships with the City of Brampton to increase the flow of federal funding to deal with Brampton’s many growth-related challenges as the city continues to absorb a disproportionate number of the GTA’s newcomers. Throughout his time as a rookie MP, Grewal has been a regular contributor to Brampton political conversations on social media. On Nov. 22, it appeared he had put out his last post on Facebook as a Brampton MP, stating that because of “personal and medical reasons” he was stepping aside. The Facebook post, not an official avenue for an MP to resign, was met with skepticism. The vague reasons he listed ignited speculation, but residents didn’t need to wait long for clarity. A statement from the Prime Minister’s office said Grewal was resigning because of a gambling problem. “Earlier this week, Mr. Grewal told us that he is receiving treatment from a health professional related to a gambling problem that led him to incur significant personal debts,” the statement to The Pointer said. With Grewal’s status as an MP still in the air, questions were being asked about the fate of the ethics commissioner’s investigation involving Trudeau’s India trip. “The inquiry into the conduct of MP Grewal will continue as soon as possible in spite of his resignation,” the Office of the Conflict of Interest and Ethics Commissioner tweeted. The office did not clarify whether this meant the probe had been temporarily suspended. The same day, The Pointer contacted the offices of Gahir and Associates, the law firm Grewal derived “employment income” from. A receptionist said Grewal worked directly with lawyer Harinder Gahir, but would not divulge what that work entailed. Further revelations surfaced about Grewal’s gambling problems. The Globe and Mail, quoting anonymous sources, reported that the RCMP had been investigating Grewal’s actions for months after having been tipped off by the Financial Transactions and Reports Analysis Centre of Canada (FINTRAC), which requires casinos to report transactions of more than $10,000 made in a day. The Pointer visited the offices of Zgemi Inc. and was told Grewal offered legal consulting, but that CEO Yusuf Yenilmez was not in the office. There was no response to a request for comment. The Pointer published a story revealing that Grewal and Mississauga MP Navdeep Bains, currently the minister for innovation, science and economic development, were given confidential details about a local land deal by the former mayor’s chief of staff. The deal had ended up costing the city an extra $1 million over the price it had originally negotiated. A third-party probe launched by the City of Brampton found that Linda Jeffrey’s chief of staff, Hasneet Singh Punia, leaked confidential details about the planned property purchase along Goreway Drive to Grewal and Bains. The city needed a provincially owned 20-acre parcel to solve a traffic congestion issue on Goreway Drive, south of Steeles Avenue. Punia told Grewal and Bains about the agreed price of about $3.3 million. The city’s deal with the province never went through, but the land was snatched up by a private consortium called Goreway Heaven Inc. shortly afterward for close to the same amount and then resold to the city this past January, just months later, for $4.4 million. Council was concerned enough about how that had happened to ask Froese Forensic to investigate the deal. Then, after hearing reports that Grewal was being investigated for transactions at Ottawa casinos, the city’s legal staff recommended in an emergency meeting that the findings of the investigation be sent to the RCMP. The Goreway Bridge project has been a thorn in the side of Brampton and Mississauga residents for years. CN trains crossing at this point cause lengthy delays multiple times a day, leading to severe traffic backups at the crossing on Goreway Drive. On May 30, city council approved closing Goreway Drive at the CN tracks as the first step toward building an overpass bridge to alleviate the problem. The entire project is estimated to cost $33 million. Subject to approval from both CN and the Region of Peel, a tender for construction is expected to be released this year. Grewal had championed the project even before he was elected as MP in 2015. 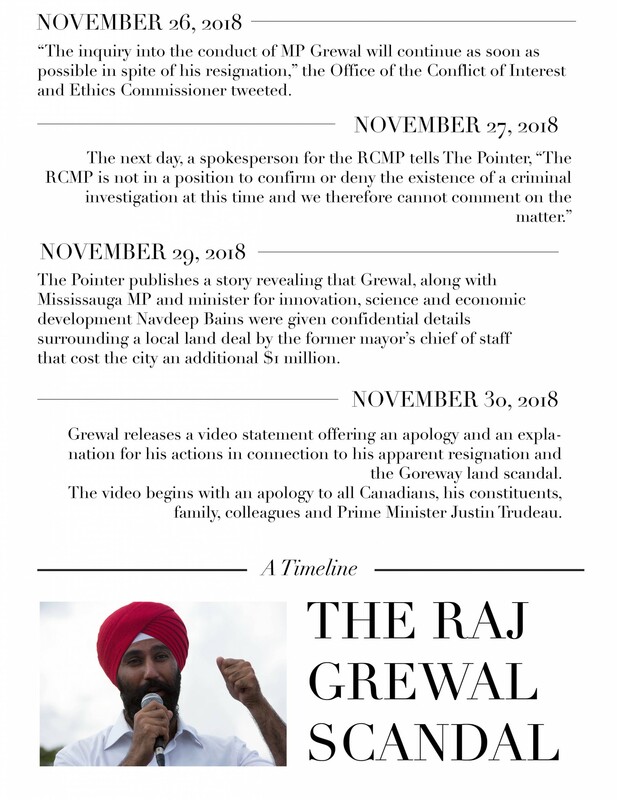 A day after The Pointer published its story, Grewal released a video statement offering an apology and an explanation for his actions in connection with his apparent resignation and the Goreway land scandal. The video begins with an apology to all Canadians, his constituents, family, colleagues and Prime Minister Justin Trudeau. He had gambled recreationally since university, according to his statement, but the habit developed into a mental health issue when he started to play high-stakes blackjack at a casino next to the hotel he stayed at as a parliamentarian. He says he started to borrow money solely from friends and family to continue gambling, and that all the money has been paid off, largely with the help of his family. He says he has decided to leave the Liberal caucus and take a leave of absence to focus on treatment, and that he will decide about his political future before Parliament resumes in 2019. Grewal also addresses his involvement in the Goreway Bridge plan, after The Pointer’s report on the investigation. The company that sold land to the city for the Goreway bypass released a statement saying it received no information from any politician or political party to help it acquire and sell the property. The statement was released on the Facebook page of Jaswinder S. Bhatti, who is listed in corporate records as an officer and director of Goreway Heaven Inc.
Parliament will resume on this date. Grewal promised in his video to make a decision on his political future ahead of that session.